Earn up to 1,920 reward points. Finally there is a Tremolo with everything you could ever want and was designed for the player that wants a plethora of tremolo options underfoot. The Latitude utilizes digital technology to control a completely analog guitar signal path; bringing you the best of both worlds. Consistency, tone and control. With its tap tempo controls and multiple time divisions, the Latitude is easy to sync with whatever song you are playing. Have a drummer whose time keeping is a little off? The tap tempo control will regulate your tremolo speed on the fly. The Latitude Deluxe offers players the choice of four divided sub-divisions: Quarter notes, eighth notes, dotted eighth notes, and triplets. With your choice of 3 waves forms (peak, sine, and square) you can keep your tremolo classy or get it as nasty as you want. 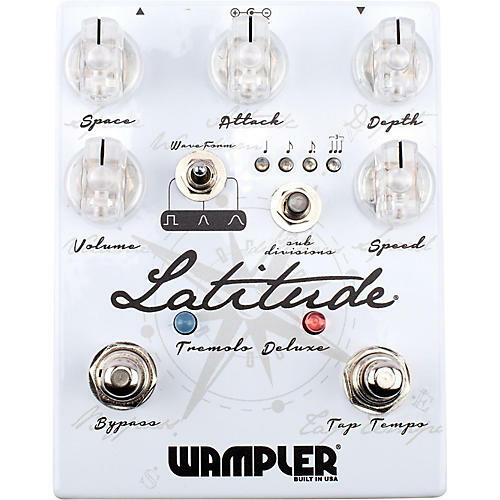 From true vintage mojo to modern syncopated pulsating, the Latitude Deluxe was designed to cover all of your tremolo needs. Three choices of waveform (square, sine and peak)  Speed, depth, attack, space and level controls.